This talking parrot toy gift will delight family and friends - while perched on his swing, it happily repeats everything you say TWICE in its own parrot accent that sounds sooo funny! This toy talking parrot(the original Pete the Repeat parrot) contains a tape recorder and a microphone that plays back the segment of the sound made while facing the toy parrot. This brightly colored parrot toy gift also comes with a perch for those times when you need to set him down, but he�ll keep talking �til you switch him off! What a day brightener (and no bird cage to clean)! Nice toy gift for all to play with and enjoy. It occupies a space of 8 inches high, 7 inches wide and 4 inches deep excluding the included optional hanging swing. 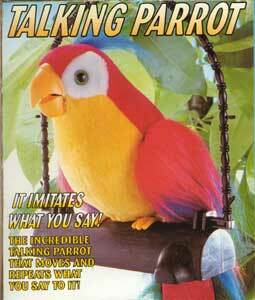 This battery powered toy parrot requires four "AA" batteries to operate (Sorry, not included). For child safety, a small four way screwdriver is required to open the two secured battery compartments on the bottom (Sorry, not included). Contains small parts so it is not recommended for children under 6 under continuously supervised by an adult.